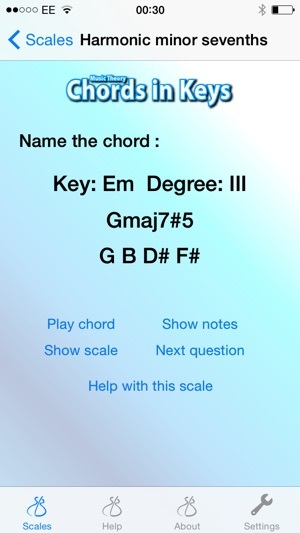 A music theory app for all musicians that trains users to identify which chords and arpeggios lie within each of the four most common scales, in all 15 major and minor keys. Audio and detailed help pages are included. Music Theory - Chords in Keys is a music theory app that will train you to think your way around musical keys quickly and efficiently, as well as improve your aural skills. Many musicians learn basic music theory but lack the fluency and speed of thought required to maximise its usefulness. With regular use of Music Theory - Chords in Keys you will know what each of the diatonic triad and seventh chords are within all 15 of major, natural minor, harmonic minor and melodic minor scales - an extremely useful skill for any musician. After installing Music Theory - Chords in Keys, choose the scale that you would like to work on (major, natural minor, harmonic minor, melodic minor) and the chord types (triads or sevenths). The app will then display a key and a Roman numeral indicating a degree of the scale. You then have to work out what chord is built off that degree of your chosen scale. Click 'Show chord' to reveal the answer. 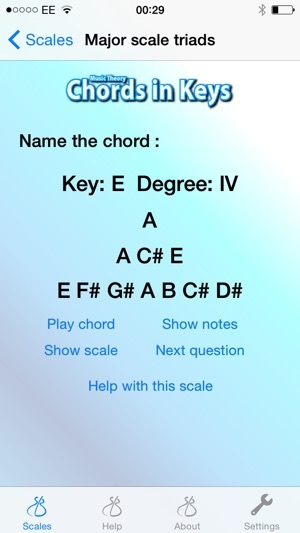 You can also reveal the notes in the scale and the notes in the chord in question, either to help you to work out the answer or as an additional tests of your knowledge of chord and scale structure. The key to success with music theory is repetition. You should use this app every day to build up an intimate familiarity with each of the chords and arpeggios within each of the given scales. Learning these essential diatonic frameworks will make learning, performing and composing music easier, more efficient and more meaningful. As well as improving your knowledge of music theory, Music Theory - Chords in Keys goes beyond most music theory apps as it features audio. Click 'Play chord' and you will hear the tonic chord for the current scale, then the chord in question, then the tonic again. This helps you develop your aural skills alongside your technical understanding of chords and scales. Eventually you will know what each diatonic triad and seventh chord sounds like in the context of its parent scale. A summary of the relevant music theory of chord-scale relationships is included in the help pages for each scale and chord type. With regular use of this music theory app, you will know what all the fundamental three and four note chords are in each of the four scales, in all 15 major and minor keys, and you will be a better musician because of it. - No music-reading skills required! 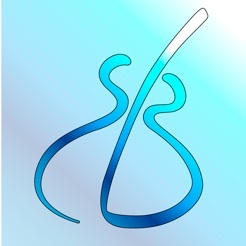 This music theory app is ideal for guitarists, pianist, brass players, wind players, strings players, singers and just about anyone that would like to improve their knowledge of music theory, chords, arpeggios, scales and keys; whether you play rock, pop, jazz or classical music. 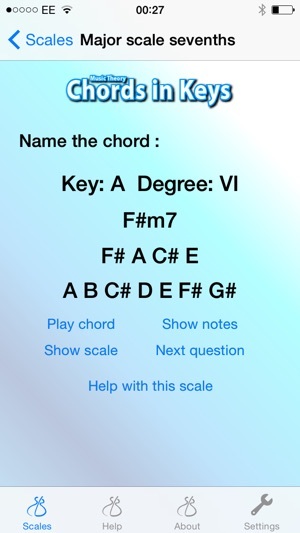 Music Theory - Chords in Keys is a music theory app designed by guitarist and music educator Stuart Bahn to help music students improve their musical knowledge even whilst away from their instruments. Download Music Theory - Chords in Keys now make your move towards music theory mastery. 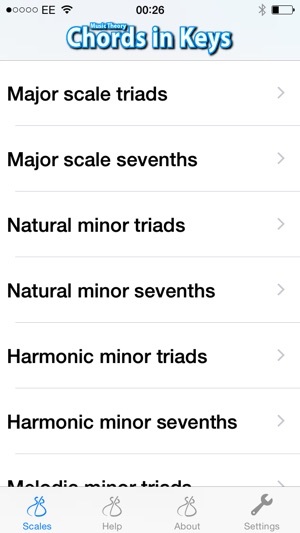 If you like this music theory app, please leave a review in the App Store. I've been using this app for over a week now and I've already seen a great improvement. This app has helped me figure out what notes and chords to play in any key by memory. This is a crucial part of music, especially if you want to play in a band or even compose independently. If you want to improve your music theory you can't go wrong with this app! I'm really glad I bought this app. It helps me to structure my practise in a number of ways making my sessions more productive. This app is intuitive, well thought out and full of useful music theory. This app helps the musician to understand theory instead of just memorising it. I wish I had it when studying music at university. Very useful for professional musicians or music students.